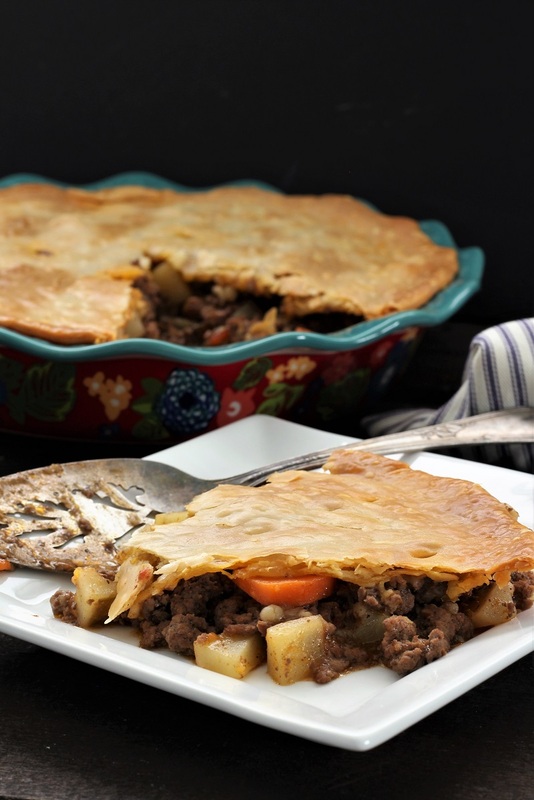 Tasty meat pie is a nice meal that you can put together in a matter of minutes. 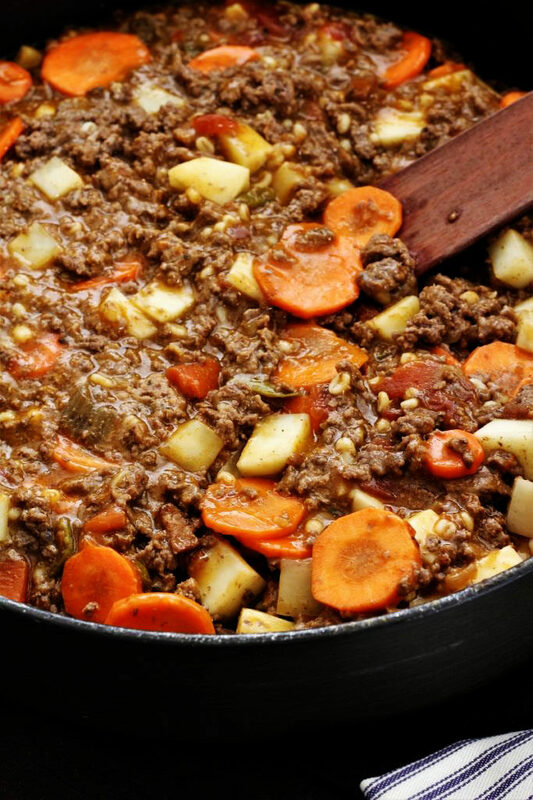 Ground beef, onions, salt, pepper, beef with vegetables and barley soup, mixed with golden mushroom soup, potatoes, and carrots, topped off with a pie crust and you are well on your way to a fabulous dinner. We love to make tasty meat pie before the weather gets too hot just because you do have the oven on for awhile, and it does warm the house up just a bit. But let me tell you, it is worth the wait of it baking in the oven and well worth the wait of how yummy it tastes. You are welcome to make your own pie crust for tasty meat pie, but I was feeling a little bit lazy and I had an extra crust from the amazing Toll House Pie that I made a few weeks ago. The middle of this pie does make a little bit more than a 9″ pie, but I just use the left overs to make hamburger soup. 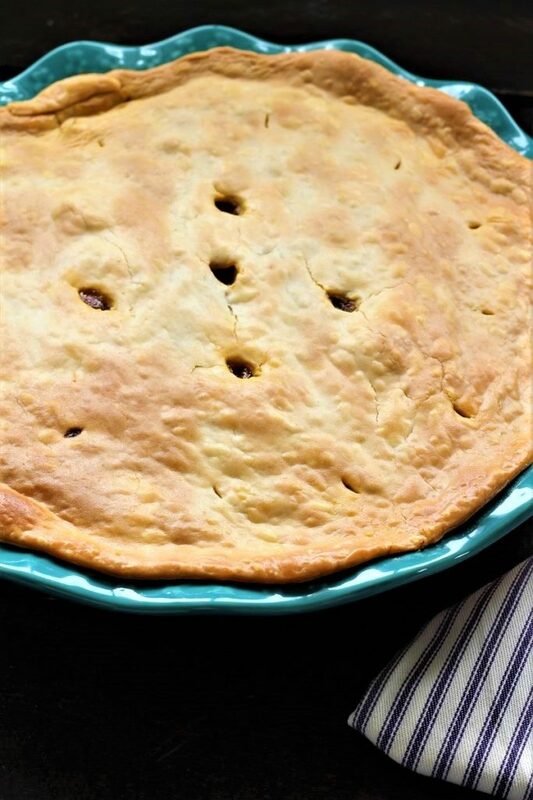 If you want, you could make two 9″ pies; you may want to freeze one tasty meat pie and use it at a later date. It depends on how full the pans are. That way you can just put the left overs right in the soup and it helps make just a little more soup. More for left overs. Yum! I know that it is just about the end of soup weather, but you just might want to hurry and get some of this yummy soup on the table. So what are you planning for the summer, it will soon be here and I think that we better plan something fun to do that isn’t too pricey! Do you guys have any great ideas? I heard some wonderful ideas today that said “spend your money on memories not on stuff”. I love this idea. Well, we did have to spend some money on stuff. Our fridge went out the other day. The milk was sour and the ice cream was soup. We thought about fixing the fridge, put we just weren’t sure which part needed to be replaced. Then we had to have our A/C fixed because my son’s dog decided to chew on some of the wires. Now that is a little scary, he could have been electrocuted had he decided to chew on different wires. So we are in the process of putting a little fence around our A/C unit. I must tell you that I went to a place that is close to me and looked at their refrigerator. They didn’t have any white ones except one. It was not anything that I cared for, it did have a matte finish, but the handles were a copper color. It was $1,000 more that another one that I liked better. So we decided to go and look in the scratch and dent area, and lucky for us, there was one that we liked, and it was $600 off the regular price. So we bought it. My husband was gone with my son the next day, because my son was racing on his motorcycle. He crashed a couple of times and he is having a very hard time with his neck; sounds like we better get him checked for whip lash. Anyway it was getting late on Saturday night and I decided that I had better get in the truck and go get the fridge. So when I got over there, thank heavens my husband had some straps in his truck, since they strap the motorcycles in at times. The guy at the store was nice enough to help me strap it in and then I drove home very slowly. I really lucked out because there were not cars on the road. You know how sometimes you get someone behind you and they tail gate you all the way home. Nope, I was lucky and I didn’t even see a car. Then my son and husband got home and we decided that we would hurry and bring in the new fridge. Well, that was not lucky because it took us 1 1/2 hours. The fridge was too wide with the door handles sticking out on the fridge. And then we also had to take the doors off our house to get it in the house. There were wires that were attached to the door and so we finally set the door on top of the fridge and brought it in. I am not sure that my son was very happy to help us since he had a stiff back and neck. But thank heavens he did it anyway. And the fridge works and all is well. It is really nice because when I open the doors, I can see all of the shelves and there is a lot of room. I must say that I do miss my white fridge, this one shows finger prints. I am not sure who thought up that great idea, but they were not thinking, or they decided that their wife or mother needed something else to do. Oh well, this too shall pass and I will enjoy it. I will just have to keep a shining rag close by. 1- If you are in a hurry, use ready made crust. 2- You might have to add more or less time to the recipe according to your stove. I cooked mine until the top was nice and brown. In a medium skillet, brown the ground beef. While it is cooking, sprinkle it with the dried onions, salt and pepper, and onion salt. Add the soups, potatoes, and the carrots. Place the mixture into a 9" pie dish. Cover the mixture with the pie crust and make slits in the top. Seal the edges and bake in a 350 degrees oven for 50 - 55 minutes. Ughhh we just had to buy a new refrigerator too. I hate adulting lol. This meat pie looks like a yummy dinner!m though! My boys would love it! Bless your heart! I must say that I love my new fridge. It is so much easier to find what I am looking for. It’s just too bad we have to pay for it! Ha ha. And yes adulting sometimes is for the birds! Thank you for stopping by Kelly!